Recon is Camden County Police Department's newest K-9 Officer. His partner and handler is K9 Officer Wilberto Ramos, Friday, March 18, 2016. Finally, a dog-and-pony-show that delivered. Well, the dog part at least. 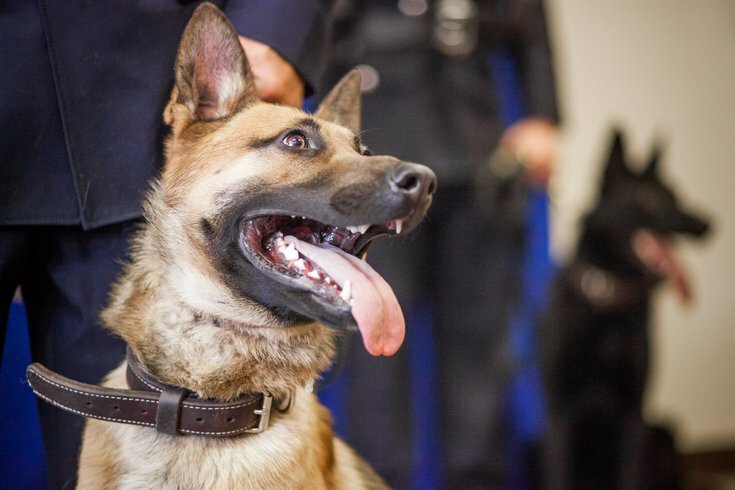 While the politicians and dignitaries outnumbered them, a roomful of Camden County’s finest members – K-9s and their handlers – managed to steal the show Friday at the county police headquarters. Infrequently Asked Questions: Can I give my cat or dog the flu? 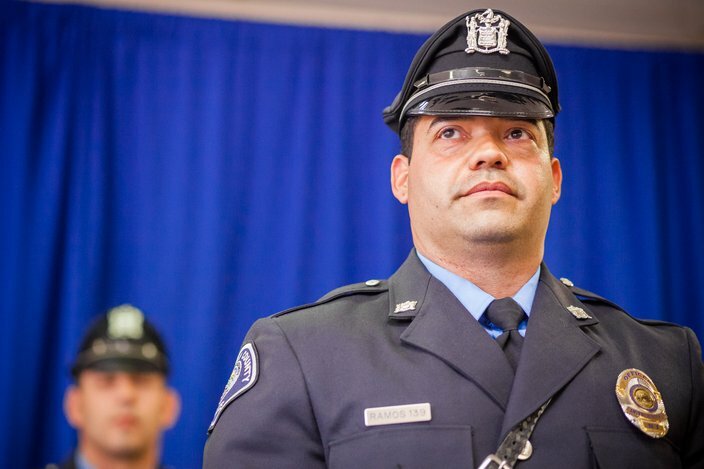 The occasion was the introduction of the force’s newest member-in-training, Recon, and his partner, Officer Wilberto Ramos, a former detective anxious to return to patrolling Camden's streets. Once deployed in June, Recon will return the K-9 unit back to its seven-dog capacity when he finishes 16 weeks of training. The 15-month-old shepherd will fill the void left when Zero, the most honored K-9 in the state, died unexpectedly in December from gastric torsion at the age of 12. Like spirit guides, the ashes of Zero and his still-emotional handler, Lt. Zsakhiem James, were a part of the presentation. Recon didn’t come cheap, but the $10,000 cost of the dog and his education was paid for by Verizon. K-9 Officer Wilberto Ramos of the Camden County Police Department is Recon's handler. The company’s Gina LaPlaca was on hand, presenting a symbolic check to the department. Recon will join a dog named FiOS, a previous K-9 gift from Verizon to the city. Recon has “large paws to fill,” quipped County Freeholder Director Louis Cappelli Jr. The officer brought an urn containing his former K-9 partner's remains to the ceremony, as well as picture of them on duty together. 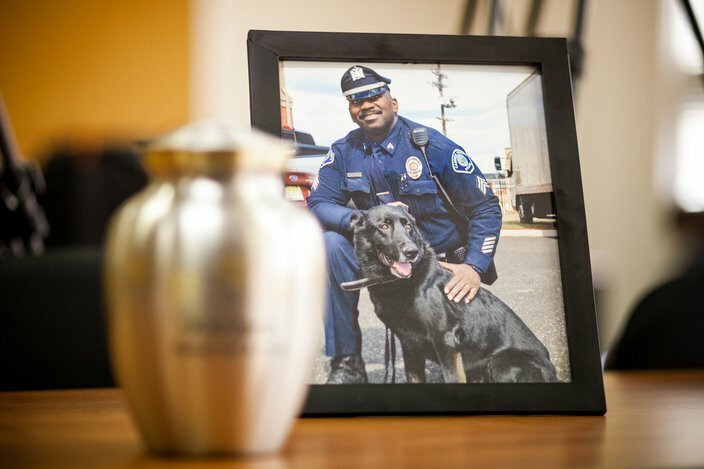 A photo of Camden County Police Lt. Zsakhiem James and his former partner, the late K-9 Officer Zero, and an urn containing Zero's ashes was on display, Friday, March 18, 2016 at police headquarters. Chief Scott Thomson praised Zero and the K-9 unit, and then welcomed Recon. “When the public has a problem, they call 9-1-1. When police have a problem, they call K-9,” said Thomson. He also praised the partnership with Verizon and said the dogs serve as ambassadors to the public, especially children, when not apprehending bad guys. So far Recon is doing well for a still-young dog, Ramos said, though he has one trait which will require a little obedience work. “He’ll do anything for a ball,” said Ramos, patting his partner on the head.